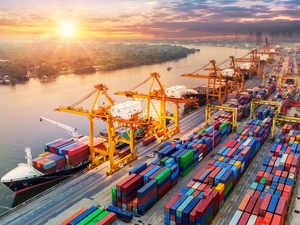 NEW DELHI: India's exports rose to a five-month high of 11 per cent in March on account of higher growth mainly in pharma, chemicals and engineering sectors, marking the outbound shipments at $331 billion for FY 2018-19, official data showed Monday. Merchandise exports in March stood at $32.55 billion as against $29.32 billion in the same month last year. This is the best growth rate for exports since october 2018, when shipments grew by 17.86 per cent. Imports rose by 1.44 per cent to $43.44 billion in March 2019. However, trade deficit -- the difference between exports and imports -- narrows to $10.89 billion during the month under review as compared to $13.51 billion in March 2018. Oil and gold imports rose by 5.55 per cent and 31.22 per cent to $11.75 billion and $3.27 billion, respectively in March 2019. For the full fiscal (2018-19), imports rose by 8.99 per cent to $507.44 billion, widening the trade deficit to $176.42 billion as against $162 billion in 2017-18. "Through secular growth over the last three financial years, following the major downturn in the face of the global slowdown, merchandise exports for 2018-19 are estimated at $331.02 billion, the highest ever, surpassing the earlier peak of $314.4 billion achieved in 2013-14. This has been achieved in a challenging global environment," the commerce ministry said in a statement. During the full fiscal, the sectors which recorded healthy growth include petroleum (28 per cent), plastic (25.6 per cent), chemicals (22 per cent), pharmaceuticals (11 per cent) and engineering (6.36 per cent). Data showed that oil imports in April-March 2018-19 grew by 29.27 per cent to $140.47 billion, while non-oil imports were up by 2.82 per cent to $366.97 billion during that fiscal. Commenting on the data, Trade Promotion Council Of India (TPCI) Chairman Mohit Singla said that despite global challenges, exports registered best ever performance. "There is a need to further focus on new products like food commodity so that the growth is more resilient and sustainable. Also, it will cushion our exports from the global volatility and shocks in the long run," Singla said. Federation of Indian Export Organisations (FIEO) President Ganesh Kumar Gupta said exports grew despite major challenges including protectionism, tough global conditions and constraints on the domestic front. "We demand for immediate support like augmenting flow of credit, higher tax deduction for R&D, outright exemption from GST, interest equalization support to agri exports, benefits on sales to foreign tourists to further boost exports," Gupta said. The ministry also said that total exports (goods and services combined) have been growing since 2016-17 and have surpassed the $500 billion mark in 2018-19 "for the first time". The overall estimated exports (merchandise and services) have reached a new peak of $535.4 billion this year, attaining a growth of 7.97 per cent. However, as the data showed, services exports in February 2019 dipped by 6.54 per cent to $16.58 billion. Imports during the month too contracted by 11 per cent to $$9.81 billion.